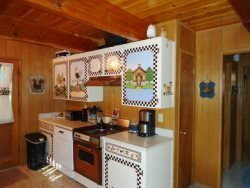 Julien Cabin - Rustic cabin with enjoyment for the whole family! Rustic, Historic Cabin . Enjoyment for the Whole Family! One small pet considered on a case by case basis. Step 4 steps up to the front door. Enter into the large open living room with vaulted ceilings with a TV/DVD and a door to large covered porch that goes the entire length of the home on the back side. In the living room is a dining table with seating for 6. Nice remodeled kitchen with Granite Counters, a breakfast table with seating for 4 or 5 and newer appliances including a dishwasher. On the main level there are two bedrooms; with a queen bed in each - one has outside access. There is a full bathroom that has also been recently remodeled with a tub/shower combination on the main level as well. Upstairs you will find an additional bedroom with a Queen bed and single rollaway along with a loft/sleeping area that has three single beds next to an additional full bathroom with a shower. Upstairs has a tv w/DVD-VCR. There is level parking for about 5 cars.